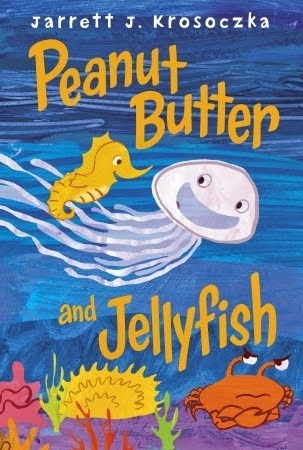 Happy Book Birthday to Jarrett J. Krosoczka's Peanut Butter and Jellyfish! Today's a big day for Jarrett J. Krosoczka (a.k.a. JJK). His delightful picture book, Peanut Butter and Jellyfish, is now available at your local bookshop and is probably being processed at your public library as I type these words. I invited Jarrett on Watch. Connect. Read. to celebrate his book's big birthday. Yay! Please watch the book trailer before you read the interview. w00t! You have two big book birthdays coming up. Peanut Butter and Jellyfish on April 8 and Platypus Police Squad: The Ostrich Conspiracy on May 6. JJK: Thank you for the book birthday wishes, Mr. Schu! In book birthday years, I'm almost old enough to rent a car. These are my 22nd and 23rd authored books. And this is especially fun because one book is in a format that I've been writing in since my professional writing career began (the picture book) and the other is in a format that I've been published in for just under a year (the middle-grade novel). 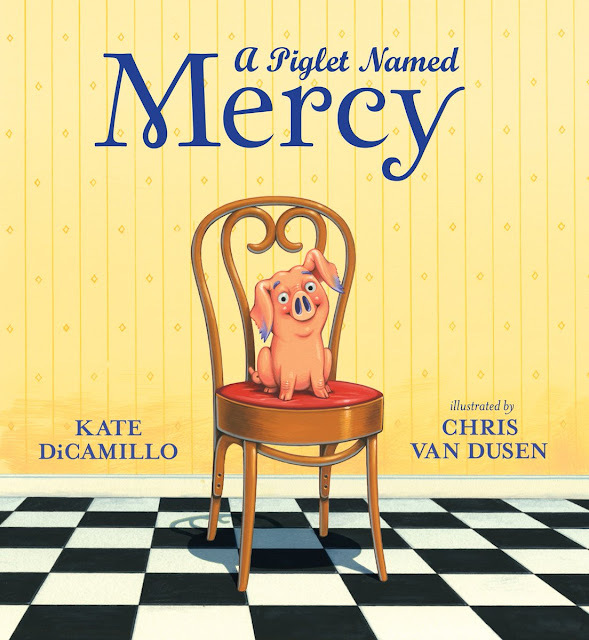 I read on StudioJJK.com that you’re hosting virtual book talks on April 10 and May 12. What will happen during these sessions? How can schools and libraries participate? JJK: Yes, this is true! I have been having so much fun with these webcasts that I've been running over the past couple of years. I'll be live in my studio and get to simultaneously engage with readers from every corner of the country. On April 10th I'll be focusing on Peanut Butter and Jellyfish. I'll be reading my new picture book, live-drawing the characters and taking questions via UStream.tv's chat function. I'll even be developing new sea-creature characters based on audience suggestions. On May 12th, I'll be talking about Platypus Police Squad: The Ostrich Conspiracy. This webcast will be especially interesting for readers who have read the first PPS book. Though if they haven't, they won't be lost—I'll be discussing how I invent characters, develop plot and what inner pressures come when writing a sequel. And again, I'll be live-drawing and taking questions. I heard through the grapevine that Lunch Lady and Betty are looking forward to May 2, 2014. Why? JJK: The first Friday of May is always Lunch Lady and Betty's favorite day of the year—and not just because it's Pizza Day at their school. May 2nd will be the 2nd annual School Lunch Hero Day! It's a day where kids everywhere can express their gratitude to their cafeteria staff through creative projects. I saw so many wonderful celebrations last year, which you can see catalogued on my Pinterest page. I can't wait to see what kids come up with this year and I'm very eager to see how many celebrate. And I should note—School Lunch Hero Day plans need not be elaborate. A simple thank-you card goes an incredibly long way! I'll be celebrating with Random House Children's Books, the School Nutrition Association and First Book by surprising a school with a school visit. Also this year, the SNA launched an online store with items to help you celebrate—posters, balloons and yellow aprons to name a few! It's really like a Valentine's Day for cafeteria employees, and I'm thrilled by how much joy it spreads—they all deserve to feel like superheroes! 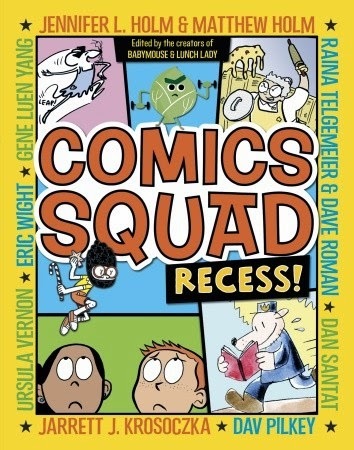 My students and I are SUPER excited for the release of Comics Squad: Recess. What do you want everyone reading this blog post to know about it? JJK: I am bursting at the seams for everyone to read it! And to see the book trailer! (NOTE: I added the book trailer to this post on 5/19.) And to know about the plans that Matt, Jenni and I have for the future of the series! It really is the book we would have all wanted as kids. Imagine reading a Dav Pilkey comic, turning the page and reading a Lunch Lady comic, turning the page again and reading something by Raina Telgemeier and then comes a Babymouse comic! Never mind, you won't have to imagine it, because that book will exist for real this summer! Reading is…reading is reading is reading is reading is reading! Grown ups everywhere should celebrate whatever reading is being done by our young readers—even if they think their reading material lacks literary merit. My grandparents didn't love comics, but they sat patiently in the car while I picked up the latest issues of Batman and X-Men. I don't love every book that my daughter loves, but I read them to her with a big smile on my face because she's excited to read! I am giving away one copy of Peanut Butter and Jellyfish. 1. It will run from 4/8 to 11:59 p.m. on 4/10. Borrow Peanut Butter and Jellyfish from your school or public library. Whenever possible, please support independent bookshops. Woohoo! Two book birthdays - less than a month apart! Congratulations on both books. Cannot wait to read them!